Tomorrow, Monday, January 20, at 10:00 GMT (that's 5:00 am ET) a wake-up call will ring on ESA's Rosetta spacecraft. The alarm will bring Rosetta out of hibernation after over two and a half years in preparation for its highly-anticipated rendezvous with a comet. The wake-up will incite the warming of Rosetta's star trackers, which allow it to determine its orientation in space. Six hours later its thrusters will fire to stop its slow rotation and ensure that its solar arrays are receiving the right amount of sunlight. Using its thawed-out star trackers Rosetta will aim its transmitter towards Earth and, from 500 million miles (807 million km) away, will send a thumbs-up signal that everything is OK and it's time to get back to work. From that distance the transmission will take 45 minutes to reach us. Rosetta's first signal is expected between 17:30 – 18:30 GMT (12:30 – 1:30 p.m. ET). Once we're assured all is well, Rosetta has a very exciting year ahead! After nearly a decade of soaring through the inner solar system, flying past Mars and Earth several times and even briefly visiting a couple of asteroids (2867 Steins on September 5, 2008 and 21 Lutetia on July 10, 2010) Rosetta is finally entering the home stretch of its mission to orbit the 4-km-wide comet 67P/Churyumov-Gerasimenko. 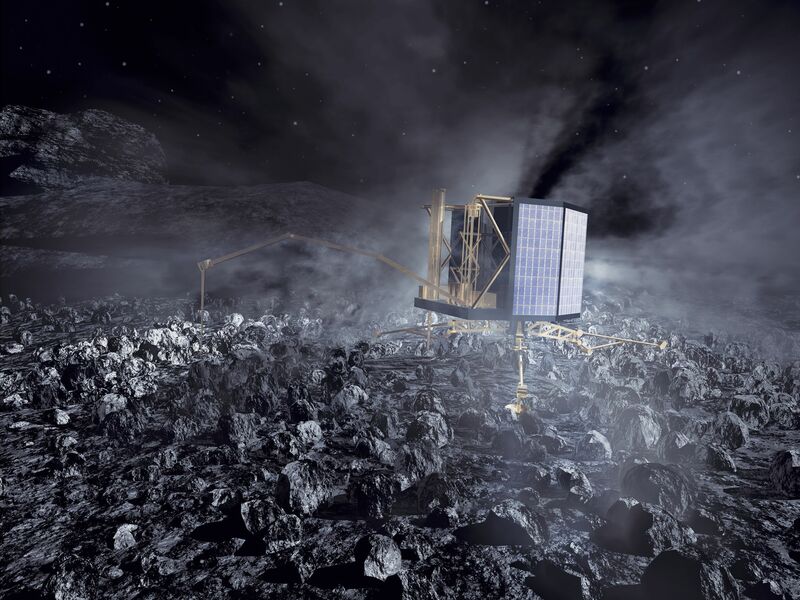 Artist's impression (not to scale) of the Rosetta orbiter deploying the Philae lander to comet 67P/Churyumov–Gerasimenko. Credit: ESA–C. Carreau/ATG medialab. With Philae firmly attached to the comet, Rosetta will follow it around the Sun as it makes its closest pass in August 2015 and then heads back out towards the orbit of Jupiter. Rosetta will provide the most detailed observations ever of a comet's composition and dramatic evolution as it encounters the heat and energy of our home star. Of course, before all this can happen Rosetta first has to… WAKE UP! It entered hibernation in July 2011 and has remained silent in a slow spin ever since, with only its computer and some heaters kept running. Waking up from a 31-month nap can't be easy, so ESA is inviting people around the world to help Wake Up Rosetta (and possibly even win a trip to Germany for the landing in November) by sharing their short movies of how best to awaken a sleeping spacecraft and sharing them to thecontest page on Facebook or to Twitter, Vine, or Instagram with the #WakeUpRosetta hashtag. Want to find out where Rosetta is right now? Check out this cool interactive map from Daniel Scuka, Senior Editor of Spacecraft Operations at ESOC. Rosetta launched on March 2, 2004 by an Ariane-5 G+ from Europe's spaceport in Kourou, French Guiana. Read more on the mission page and the Rosetta blog here. This post by Jason Major originally appeared at Universe Today. It has been republished with permission.